Buy Blueborn Kids Pool Turtle Spray - Children´s pool, paddling pool with spray function (garden hosepipe) from Blueborn at Camping Outdoor online. This inflatable children´s pool offers boys and girls fun ways to play and splash around. Thanks to the child-friendly and colourful design of the sweet turtle, the paddling pool is ideal for children aged 3-6 years. The water playground also has a fun spraying function - by simply connecting a garden hose, water splashes out of the air ring in a high arc. This makes this action pool the perfect outdoor playground. With a length of approx. 214 cm and a width of approx. 189 cm, the installation pool offers a pleasant size for splashing around in the garden, on the terrace or during summer holidays at the campsite. The robust air chamber provides gentle shock absorption. With a packing size of 30 x 24.5 x 11 cm, the lightweight with approx. 1800 g enables space-saving storage over the winter months. Should the play equipment ever be damaged, a high-quality repair set is included in the scope of delivery. 1. Attention: Not suitable for children under three years of age. 2. Attention: Use only under adult supervision. The innovative design of the friendly turtle provides a special highlight in every garden or on the campsite. The paddling pool is equipped with a fun spray function - by simply connecting a garden hose, water splashes out of the air ring in a high arc - making this action pool the perfect outdoor playground. Unpacking, inflating, replenishing - the multi-coloured, large children´s pool is on the lawn in no time at all and swimming fun can start right away. With this oval model, the voluminous, inflatable ring, which is filled with air quickly and easily thanks to its high-quality valve, ensures a stable and secure footing. When inflating the toad´s head and feet straighten up, as the pool consists of a single air chamber. With its outer dimensions of 215 x 189 cm and a height of 61 cm, this paddling pool is often used as a children´s pool on hot summer days. If the basin is filled to 75 %, 200 litres provide a refreshing cooling. With its small packing size of 30 x 24.5 x 11 cm, the lightweight 1800 g makes possible space-saving storage over the winter months. In addition to bellows foot pumps, the Blueborn range also includes double-stroke pumps for simple and fast manual air filling. The electric blower pumps with 220V or 12V connection are particularly convenient. Discover air pumps and many other Blueborn products. Just click on the blue marked ´´Blueborn´´ below the article heading and dive into our leisure world. The children´s pool in a cheerful turtle design is ideal for girls and boys aged 2-6 years. The 215x189 cm swimming pool offers plenty of space for playing and splashing around. The air ring with fins and head of the turtle ensures a height of 61 cm. This is enough to make your children happy on sunny days in the garden, on the terrace or camping site. The pool not only looks great, but also gives your children a lot of fun on sunny days in the garden, on the terrace or on the campsite. The pool can also be used as a ball pool. If the paddling pool is damaged, a repair kit is included. Due to the packing size of 30x24.6x11 cm, the pool with a weight of approx. 1.8 kg can be stowed away to save space. 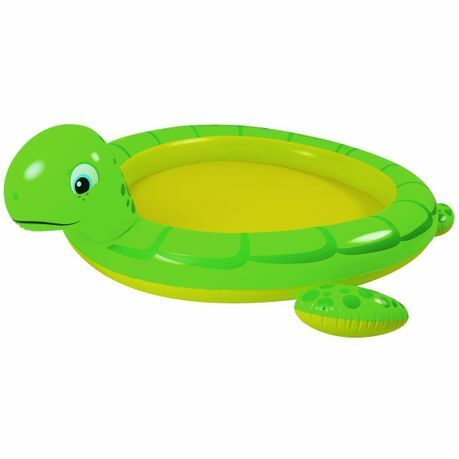 The optimal paddling pool for every child, the sweet turtle convinces visually. Every children´s event or children´s birthday party becomes complete with this eye-catching paddling pool.